Enfield, CT – June 26, 2017 – Gilbane Building Company, a nationally recognized leader in construction of K-12 education facilities, joined the Enfield High School Building Committee, community leaders, students, faculty and residents on Saturday, May 13, 2017 for a ribbon-cutting ceremony to celebrate the renovated Enfield High School. “We are truly pleased with the entire team that executed this project. Their commitment to caring, not just about the actual construction program, but the students, the community and the overall safety of all involved was stellar. Thank you to Gilbane for their leadership and dedication in taking on this challenging program for the Town of Enfield,” noted Randy Daigle, Enfield High School Building Committee Chairman. 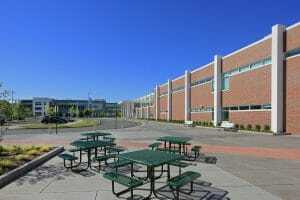 Gilbane served as construction manager at-risk for the renovations at Enfield High School. The consolidated high school encompasses a new 106,000 SF addition for science, technology, engineering, art, and math (STEAM), a 14,000 SF music addition, and an expansion of the cafeteria, kitchen, physical education and health departments. The remainder of the school was fully renovated within the state of Connecticut renovate-like-new requirements, which requires all aspects of the building and site to be updated to current codes including the state’s high performance standards for energy. The “like new” statute mandates a minimum life expectancy of 20 years for the entire building. Gilbane provides a full slate of construction and facilities-related services – from pre-construction planning and integrated consulting capabilities to comprehensive construction management, general contracting, design-build and facility management services – for clients across various markets. Founded in 1873 and still a privately held, family-owned company, Gilbane has more than 50 office locations around the world. For more information, visit www.gilbaneco.com. A builder in Connecticut since 1944, Gilbane has grown to become one of the largest providers of construction management services in Connecticut. Gilbane opened an office in Glastonbury in 1984 and has remained a leader in the delivery of comprehensive pre-construction services, construction services and construction administration. In 2014 Gilbane was named Contractor of the Year by Engineering News Record (ENR) for the Tri-State Area (NY, NJ, CT) and the #3 Top Construction Firm in the State of Connecticut in 2013 according to Book of Lists CT. Gilbane is ranked one of the top three best construction firms in the State of CT by the Connecticut Subcontractors Association.